A simple low sodium take on the traditional French dish. The heavenly smell of simmering beef and onions will leave you (and your lucky guests) salivating. Melt the butter in a large (lidded) saute pan over medium-high. Add the onions and cook, stirring, 10 minutes. Move onions to the side of the pan, add the cubed beef and brown on all sides, about 10 minutes. Add the water, wine and seasonings and stir well to combine. Raise the heat to high and bring contents to a boil. Once boiling, reduce heat to medium-low, cover pan with lid, and cook 1 1/2 hours, stirring occasionally. 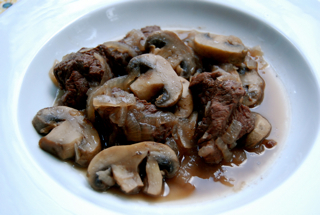 Once beef is tender, stir in the mushrooms, cover, and cook another hour. Remove from heat and serve immediately.